LiveProject Premium Viewer allows you to view and print your Microsoft project's .MPP file on any computer without the need or cost of multiple Microsoft Project licenses. Supports standalone files or files shared via SharePoint. LiveProject Premium Viewer includes Gantt, calendar views, print, export of data, auto-generation of PowerPoint presentations and powerful dashboards. Easy to use, and downloaded by over half a million users worldwide. ...... No other project viewer on the market today offers as many built-in features and capabilities as LiveProject. The interface is practically unchanged from the previous version and is easy to use. All the extra functionality is available via context sensitive menus or tabs, which means both experienced project managers and novices alike can feel at home with no training. 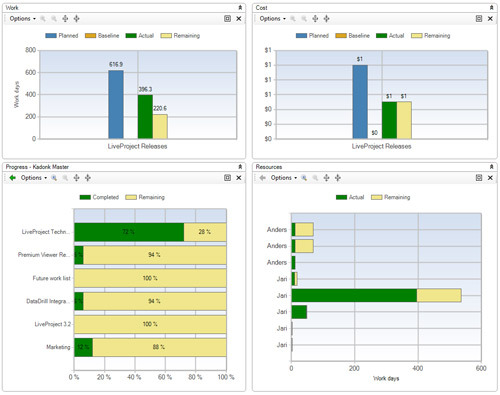 LiveProject Premium Viewer supports opening multiple projects simultaneously and includes powerful graphical dashboards with drill-down capabilities. Also included is the ability to export to PowerPoint, Excel, CSV or E-Mail using predefined or custom templates. Select the tasks you need to present, and with one click LiveProject will generate a slideshow with all the information you have specified. Qweas is providing links to LiveProject Premium Viewer 5.1.1 as a courtesy, and makes no representations regarding LiveProject Premium Viewer or any other applications or any information related thereto. Any questions, complaints or claims regarding this application LiveProject Premium Viewer 5.1.1 must be directed to the appropriate software vendor. You may click the publisher link of LiveProject Premium Viewer on the top of this page to get more details about the vendor.